Peaceful Reader: Fanny would make a great gift! Saturday was drizzly and dreary, so Fanny decided it was an excellent day to make her very own picture book. At the top of the first page she wrote Annabelle's Adventure. Annabelle was Fanny's favorite doll. Fanny had made her, after all. She didn't know what the adventure was yet. She only knew Annabelle was going to have one. The illustrations are a mix of Holly Hobbie's and Fanny's as they discover an adventure just waiting around the corner from Ted's Deli and like most, very unexpected. This has just enough moral dilemna without being too didactic~just a pinch of honesty thrown in to the mix as Fanny finds an envelope with money in it on the sidewalk and must debate just what to do with her find. Fanny is a well-drawn and likeable character and her mother is filled with soft, good sense advice. 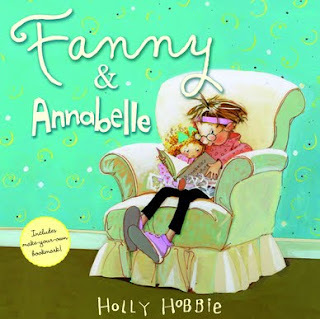 We enjoy Fancy Nancy's escapades but Fanny just seems more our style. Thank you Holly Hobbie! Groovy Girl and I highly recommended both books for a young lady on your gift list at this special time of year. This copy is from our very own public library. Great review by Energizer Bunny's Mommy. Read my review of sorts of Fanny.